With respect to a Stop Work Order, as an EVMS project manager, did you know that a contractor has 30 days after the end of the period of work stoppage to assert its right to an equitable adjustment? While the claims process is not typically considered part of Earned Value Management (EVM), it certainly occurs simultaneously with EVM actions and is critical to a contractor’s administration of the contract. Asserting the right to submit a claim for a Stop Work Order must be timely, and appropriate supporting data must be generated to ensure the contractor receives fair compensation for the customer’s interruption of contract execution. An SWO is a temporary suspension of work enabling the customer to re-evaluate the contracted work. Completing work scope within contract funding limitations. A Stop Work Order could affect the entire contract or could be focused on a specific deliverable item, component, or function. A key concept about Stop Work Orders is that they are temporary. The Federal Acquisition Regulations (FAR) envision that Stop Work Orders are resolved within 90 days but allow that the timeframe can be different subject to customer and contractor agreement. 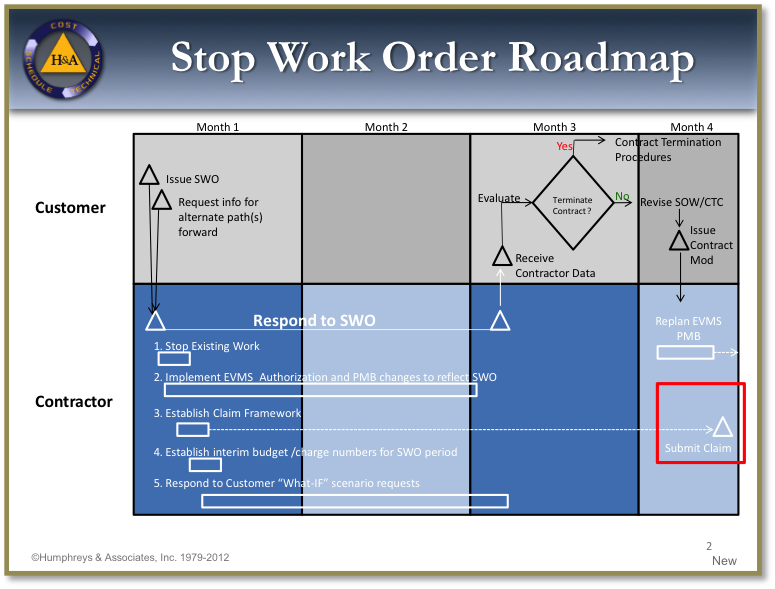 The resolution of a Stop Work Order could result in a revised work scope approach (technical, schedule, and/or cost) or possibly the cancellation of the contract. How does a claim intersect with EVM for Stop Work Orders? When a Stop Work Order is issued, the contractor follows EVM procedures to stop the affected work and move budgets from affected control accounts to Undistributed Budget. Simultaneously, the contractor should establish budgets and charge numbers to measure progress and collect costs for any work tasks required by the Stop Work Order. These tasks could include responding to customer requests for information related to a revised technical or funding approach as well as preparation of a proposal for the revised contract work scope. At the same time, the contractor should also establish charge numbers to collect costs for any other expenditures that result specifically from the Stop Work Order but are not part of the Authorized Unpriced Work described in the Stop Work Order. These “other” expenditures become the basis for the claim. As described in the previous paragraph, a good example of “other” costs would be severance pay for furloughed workers caused by the Stop Work Order. When are claim proposals submitted? Logically, proposals for the Authorized Unpriced Work (which should be fee-bearing) and the claim would be submitted and evaluated separately. In practice, the customer and the contractor often agree that one proposal for all of the Stop Work Order impacts will be processed. Regardless of the approach used, the contractor must segregate and substantiate costs for both the Stop Work Order AUW and “other” costs claimed. If a proposal for the claim is submitted separately, every effort should be made to submit the proposal within the 30 days after the work stoppage ends. If this is not possible, at the very least, notify the customer’s contracting officer in writing that your company asserts its right to submit the claim and provide a target date for the claim proposal submission. The graphic below illustrates the components and timing of the steps in handling a Stop Work Order and a claim submission. Copyright ©2019 Humphreys & Associates unless otherwise noted.